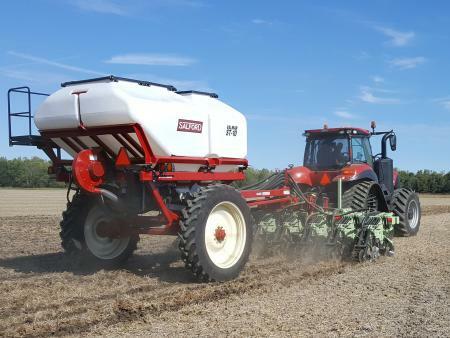 The 2nd annual Precision University Jan. 11 in London, Ohio, will feature presentations about technology that can help farmers apply fertilizer in a way that prevents it from running off the land and ending up in Lake Erie or other waterways. The conference is being hosted by Ohio State University Extension and the Digital Agriculture program team in the College of Food, Agricultural, and Environmental Sciences (CFAES) at The Ohio State University. OSU Extension is the outreach arm of CFAES. Starting in September 2017, those who apply fertilizer on more than 50 acres of land in Ohio have had to become certified every three years by passing a test or taking a course in how to safely apply nutrients to their land. The certification requirement is aimed at keeping phosphorous and nitrogen in the soil and away from bodies of water, potentially contributing to algal blooms in Lake Erie and beyond. “We’re trying to bring attention to a relevant topic,” said Kaylee Port, precision agriculture program manager for CFAES. “We’ll be sharing best management practices and nutrient technologies to help growers become even better stewards of the land and water,” she said. Precision University will feature experts in nutrient management technology from industry and academia. The “precision” in Precision University has to do with precision technology, cutting-edge machinery that ensures work on the farm is done with accuracy. Precision technology includes having sprayer nozzles of the right type and size, providing accurate direction and pressure for applying fertilizer. Another example is applying phosphorus with a strip till machine that incorporates the phosphorus into the ground. A traditional spreader typically places nutrients on top of the soil, where they have less of a chance to be taken in by the roots and stand a higher risk of running off with rainfall and seeping into nearby waterways. Besides preserving water quality, “if you can more precisely place your nutrients, you’ll get the best bang for your buck with the product,” Port said. Speakers at Precision University will include: Robert Mullen, director of agronomy for PotashCorp, a Canada-based fertilizer company; Tony Vyn, professor of agronomy, Purdue University; Jim Schwartz, director of practical farm research and agronomy for Beck’s Hybrids; Jamie Bultemeier, director of corporate sales, A&L Great Lakes Laboratories, an Indiana-based agricultural testing company; Brian Arnall, associate professor, Oklahoma State University; Dave Scheiderer, owner, Integrated Ag, an Ohio-based agricultural-consulting firm, and Glen Arnold, OSU Extension educator and field specialist in manure nutrient management systems. The event will be 9 a.m. to 3:30 p.m. at Beck’s Hybrid’s, 720 U.S. 40, in London. The cost is $50, which includes breakfast and lunch. by Alana DeMartini, originally posted by CFAES.